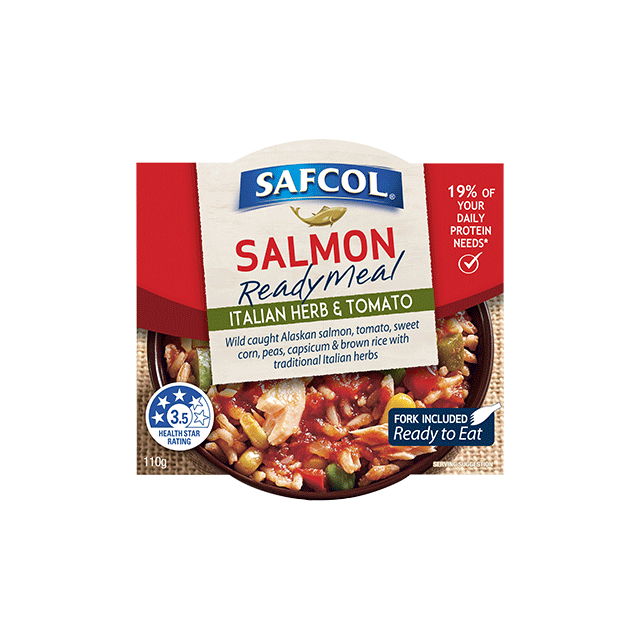 Safcol Salmon Ready Meal Italian Herb & Tomato with wild-caught Alaskan salmon, tomato, sweet corn, peas, capsicum & brown rice with traditional Italian herbs. Gives 19% of your daily protein needs. – Low in saturated fat. – Good source of Omega 3. – No artificial colours or flavours. 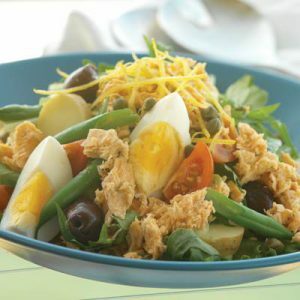 Ingredients Pink Salmon (Oncorhynchus Gorbuscha) (25%), Brown Rice (27%), Vegetables (Sweet Corn, Green Peas, Capsicum) (21%), Tomato (14%), Tomato Sauce (Tomato Paste, Sunflower Oil, Salt, Garlic, Sugar, Modified Tapioca Starch (1442), Natural Colour (Paprika Oleoresin), Food Acid (Citric), Thickener (415)), Herbs & Spice (Oregano, Rosemary, Basil, Pepper) (0.4%).